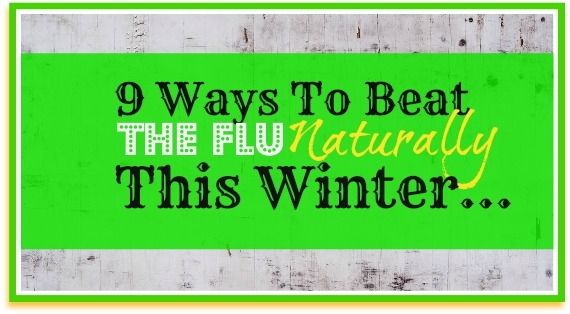 Want to Ward off the Flu Naturally This Winter? Here Are 9 Things You Can Do Now! Seriously? I cannot believe that it is already that time of year… that time when every sneeze, sniffle, or ache has you on edge that you may just be headed towards days on the couch surrounded by piles of wadded tissues and bowls full of chicken soup. Oh, and lots and lots of naps…. (oh wait, that nap thing isn’t sounding so bad). BUT…since none of us like the fevers, chills, and body aches that come along with the flu (even if those naps are enticing), the best thing we can do is be proactive and keep our systems strong, healthy, and ready to fight off those winter sickies! Taking a preventative approach and making sure our immune systems are in the best shape possible to ward off the germs will be our best game-plan to stay healthy this illness-filled season. Drink that Broth – true Bone Broth, that is. For many of my loyal followers, you will not be surprised that this is my #1 go-to defense. Grandma was right after all! Chicken soup is not only good for the soul, but, when made as true bone broth, it will go a long way in boosting your immune system and keeping you healthy. Read about all the benefits of Bone Broth here. Make sure your Vitamin D3 Levels are in a normal range – a simple blood test by your doctor will let you know where your levels lie. If they are in the lower end range, make sure you take adequate D3 supplementation and spend plenty of time in the mid-day sun this winter. Active Vitamin D is a potent immune system modulator. Much scientific evidence shows that it has several different effects on immune system function that can enhance your immunity and inhibit the development of autoimmunity and go a long way in preventing the cold and flu. Clean up your diet and fill it with whole, pure, organic, unprocessed, anti-oxidant rich, and anti-inflammatory foods. Find ways to add things such as kale, collards, tomatoes, carrots, broccoli, garlic, onions, mushrooms, blueberries, blackberries, sweet potatoes, winter squash. Add tons of produce to smoothies (frozen produce is great during the winter) or make green juices or raw vegetable soups. Drink your Apple Cider Vinegar every day – the raw, organic, kind with the “mother” still in it. Apple Cider Vinegar is rich in minerals and enzymes and is a wonderful promoter of the immune system. It actually has alkaline properties which aids your body in maintaining proper pH levels for a healthy alkaline state, crucial for a healthy immune system. Add it salad dressings, soups, sauces, cooked vegetables, or even make an Apple Cider Vinegar sipping drink. Eat your Garlic – it is anti-bacterial (it acts as a potent antibiotic), anti-fungal, and anti-viral and can prevent infections from taking hold and spreading. It is rich in Vitamin C, B6, Selenium, and Manganese and has powerful immune boosting benefits. A couple raw cloves a day will do it – chop it up and add it to salads, soups, sauces, and already cooked meals. Drink your Water Kefir – Water kefir is so simple to make and is a natural supplier of various strains of healthy bacteria and yeasts (probiotics) to our digestive tract and can help to bring balance to your inner microflora. It has a tonifying and cleansing effect on your intestines. Water Kefir is perfect for a Dairy-Free or Vegan diet and is rich in Vitamins B1, B6, and B12. Add Coconut Oil and Coconut Cream to your cooking, baking, and even your smoothies. It strengthens the immune system as it contains antimicrobial lipids, lauric acid, capric acid and caprylic acid which have antifungal, antibacterial and antiviral properties. Eat your Cultured Vegetables – Re-establish internal ecology and healthy intestinal flora with probiotics from cultured vegetables, such as real sauerkraut and lacto-fermented cucumber pickles, beets, onions or garlic. Like Water Kefir, supplementing our diet with fermented foods strengthens and supports our digestive and immune systems— thereby helping our bodies to fight off and prevent diseases, like colds, the flu, and even cancer. Focus on the health of your gut! With about 70% of the immune system residing in the gut, this is one area that you will WANT To focus on! SO…focus on this advice: Heal the Gut! My best advice is for you to try and add a few of these ideas into your diet every day. In addition, do not forget to get plenty of sleep and exercise, reduce your stress, and laugh a lot!! All of this will go a long way in keeping you feeling good this winter! Oh, and do not forget to stop by my post on The Balanced Platter today – I am doing a Giveaway of The Essential Gluten-Free Baking Guide, Parts 1 and 2, written by Brittany Angell and Iris Higgins! Now, Please tell me….What do you do to stay healthy during flu season? Thanks, Maggie! I will be interested to hear if you think that the bone broth helps Callum’s belly. I swear that stuff is amazing. There was a stomach flu going around the boy’s school and I made my boys drink a cup of broth and a bit of ACV every day while it was making it’s rounds and they managed to be some of the few who did not end up with it! 😀 And have fun with the water kefir!! I can always count on your for this type of common sense advice, Kim! It’s much needed because we can get into our routines and quickly forget some of these critical, but easy-to-do items. Thanks so much! Great tips, Kim! I haven’t tried water kefir. I guess I need to get on that. Thanks so much for the great information! My family is sick all the time and I’m trying my hardest to keep us healthy this winter, so thanks again for all the tips! Hi Cassidy! I hope that some of these tips will help your family! If you try any of them, I think the biggest ones are the bone broth, the Vitamin D levels, and the added probiotics. All of those will go a long way in boosting the immune system this winter! Good Luck! Sending healthy vibes to you all! Awesome post! My biggest thing is getting adjusted and I do lots of things on your list as well. You forgot Scallions/onions, Cinnamon and GINGER! These are widely used in TCM to treat colds and flu at the first signs. There’s a tradition of using sweet spices in Autumn and Winter recipes. It’s to ward off infections using food to nourish and strengthen. Hi Christine! Of course. Scallions/Onions, Cinnamon, Ginger, and Garlic TOO! I grow tons of onions and garlic in my garden and pretty much add both to everything. Great additions to the list! 😉 Thanks! What do I do? I hope and pray and try to breathe above the heads of my kindergarteners! What a fantastic list you’ve given us. Printing them out! I need you in my house keeping me on track girly! Don’t forget that Vitamin C – it really isn’t an old-wives tale as long as you take a good high dose of it. Knock on wood – we haven’t had a cold or flu in this house in five years, since we started daily high dose Vit C. Coincidence? I got my Vitamin D levels checked and with all of the sun this summer, I was surprised that it was “just in range.” Almost on the low end. Wow. And I got my D levels checked a couple of years ago too and was literally shocked to see that I was barely in range after living here in sunny AZ. Once I started supplementing with a quality D3 they jumped right back up, but still, I agree that it was surprising! I am an avid germ watcher! With the kids and the gym, it’s bound to happen at some point. I try to ward it off with tons of fresh seasonal fruits and veggies, ACV, I do vitamin D3, Calcium and Magnesium, garlic is a staple in our cookings and water, water, water! Great list! I need to do coconut oil more often. I seem to go in spells with it, but it’s so good! I can always count on you for such great common sense advise! Hello, in my country, people for centuries to protect against flu by increasing eating garlic. Garlic is a proven enemy of influenza and other infectious diseases. Also eating fruits and vegetables rich in vitamin C. Bone soup course is a great tool to combat the flu. Eat onions and more. The onions’ vitamin bombs “.